For all its shortcomings (and there are many), I will say one thing for August Rush - the music is marvelous. 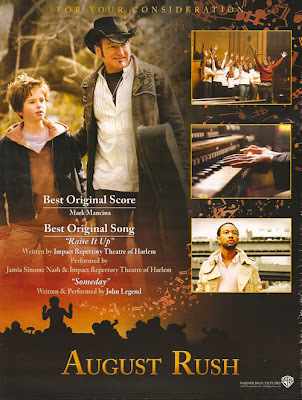 Especially the Impact Repertory Theatre of Harlem's "Raise it Up," which I would love to see nominated for Best Original Song at the Academy Awards, even if it's just to see young Jamia Simone Nash perform onstage, who is just about the highlight of an otherwise terrible film. If only the album didn't ruin parts of Mark Mancina's score by covering it with snippets of the movie's insipid dialogue.